This is George Orwell's famous satire of the Government, where he shows that Communisms is not about equality. It is, in a sense, another form of dictatorship. In this story, the animals of Manor Farm have risen up against Mr. Jones and the rest of the humans. The pigs, led by Napoleon are now in charge and they set up a set of seven rules which the Rebellion was based on. The most important ones are that humans are bad, and all animals are equal. These are printed on the barn wall. As the story progresses all the principles are changed little by little as Napoleon and the pigs get more and more corrupt by the power they hold over the other animals. The law where no animal should drink alcohol was changed so that the words 'in excess' were added. Also the law where no animal can sleep in a bed was changed so that no animal can sleep in a bed with sheets. And the most important one where all animals are equal was changed to read 'but some animals are more equal than others'. 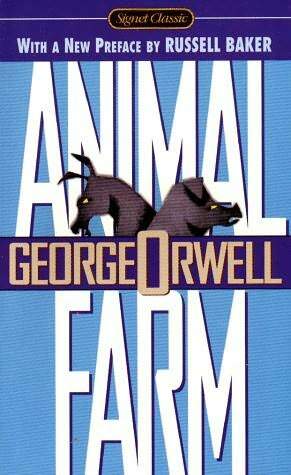 By the end of the novel, the pigs are indistinguishable from the human oppressors that the animals got rid of at the beginning. This classic book tells of the dangers of corruption in our world. Or that all men are pigs. Or that humans are just corrupt animals. Whichever. All that is important to remember is that "Absolute power corrupts absolutely. Which is a problem. If you are powerless." Like most of the animals on Animal Farm. In one way you feel sorry for them because they went from bad conditions to worse. But on the other hand you can't believe that they are so incredibly stupid to let the Napoleon get away with things at the beginning. It does show you that dangers of propaganda though. How anything can sound good as long as you put a proper spin on it. If it wasn't for the stupidity of the animals it would've been a great book. I mean I know they were supposed to be dumb, but I don't think they were that dumb. I really don't see them saying 'Snowball made me do this' a moment after they saw other die for saying the same thing. Especially since I don't think Snowball had anything to do with it. That part of the book made no sense to me what so ever. The rest of the book was good. I'm not really fond of the style of writing. It was a little old fashion for my tastes, but it was still a good book.